Bretagne — French Tier V battleship. A series of French battleships built in response to the appearance of British "superdreadnoughts". These ships were developed directly from the ships of the preceding class but carried 340 mm guns arranged under a more rational scheme. Tier V's Bretagne is like most other battleships at her tier in her turret layout and general firepower. She does not introduce anything revolutionary armor and protection wise, nor does she break any speed records. Any veteran New York or Texas player should be familiar with the play style needed to do well in Bretagne, though there are some key differences. Bretagne introduces players to the staple 340mm guns found on the next two ships in the French battleship line, though in two gun mounts rather than the distinctive quads. This makes the transition down the line quite comfortable (at least, until reaching Richelieu and her 380mm guns). As far as Bretagne’s place at Tier V, she fits well among most other battleships. Her top speed of 21 knots isn't anything remarkable, and veterans of the American battleship line will likely have painful flashbacks of how it feels playing a ship so slow. Certainly, being able to plan ahead will aid any Bretagne player greatly, as it takes too long to re-position otherwise. Thankfully, 18.1 km of range makes the low speed somewhat more comfortable, and allows for greater map presence with her guns. For a Tier V ship, Bretagne’s armor is not bad. It certainly holds it's own against equal tiered opponents, and her belt armor even extends up to the the bow of the ship, just above the waterline. Other than that strip of belt armor, she has the usual 19mm plates vulnerable to overmatch by any other battleships, so take care when fighting others. Main battery ballistics are great. Belt armor extends to the bow. Third turret faces forward, giving it fairly good angles. Citadel is well sloped and protected. Relatively small for a battleship of this tier, which makes her harder to hit, especially at a distance. Slow, at only 21 knots. Can be overmatched in most places. Lowest health pool of all tier V battleships. Hull: Upgrade to Hull (B) for more hit points, more AA, and better rudder traverse speed. Research of this module unlocks progression to Normandie. Gun Fire Control System: Upgrade to PCA n° 5 Mle 2 for an extra 10% range on the main battery. Propulsion: Unlocking and equipping the upgraded module increases Bretagne’s top speed to 21 knots. For Bretagne, research her Gun Fire Control System first, to give a boost to her in game presence and a buffer against higher tiered ships. Then, get her upgraded Engine next, for that ludicrously fast 21 knot top speed. Finally, grab the upgraded Hull for the health. Key skills for Bretagne commanders include those that increase her survivability, and make her gunnery more comfortable. Bretagne was a battleship of the French Navy built in the 1910s, and the lead ship of her class; she had two sister ships, Provence and Lorraine. The ship was laid down in July 1912 at the Arsenal de Brest, launched in April 1913, and commissioned into the fleet in February 1916, after the outbreak of World War I. She was named in honour of the French region of Brittany, and was armed with a main battery of ten 340 mm (13 in) guns. Bretagne spent the bulk of her career in the French Mediterranean Squadron. During World War I, she was stationed at Corfu to prevent the Austro-Hungarian fleet from leaving the Adriatic Sea, but she saw no action. She remained in service during the 1920s and 1930s, while her sisters were placed in reserve. She participated in non-intervention patrols during the Spanish Civil War. Bretagne escorted convoys after the outbreak of World War II in September 1939, and was stationed in Mers-el-Kébir when France surrendered on 22 June 1940. Fearful that the Germans would seize the French Navy, the British Royal Navy attacked the ships at Mers-el-Kébir; in the attack Bretagne was hit badly and exploded, killing the majority of her crew. The wreck was eventually raised in 1952 and broken up for scrap. Bretagne’s in-game model depicts the ship in 1933 condition. Her original 1916 configuration is missing. Bretagne was sunk in 1940 and did not receive any of the refits on Hull (B). The armament upgrades are based on her sister ship Lorraine when she was overhauled in 1944. Her actual AA defense consisted of fourteen (14) single 40mm Bofors, twenty-five (25) 20mm Oerlikons and eight (8) 75mm guns. Six (6) 40mm Bofors, all 20mm Oerlikons, and 75mm guns are missing from the in-game version. The four twin 100mm guns were replaced by eight 75mm/50 Mle 1922 guns in 1940. In World of Warships, Hull (B) still has the 100mm guns. Lorraine’s amidships turret was replaced with an aircraft catapult in 1934-35. It was removed in 1944 for additional AA. 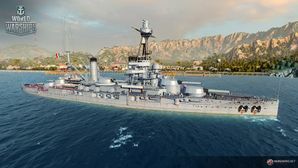 In World of Warships, Bretagne still has the amidships turret. The 25mm Hotchkiss gun was only mounted on destroyers. Measure 22 camouflage scheme which Bretagne’s sister ship Lorraine received while being overhauled in Oran, French Algeria, is missing. Bretagne-class design as depicted by Brassey's Naval Annual 1915. Sister ship Lorraine in Oran, French Algeria, circa 1943-44.